This spacious bungalow is ideal for lovers of summer holidays beside the beach and the sea. It is located 100 m. to the sea front in one of the best in-lets in Galicia, Ria de Arousa, in the peninsula of O Grove, in a residential area where many Spaniards go for their holidays. 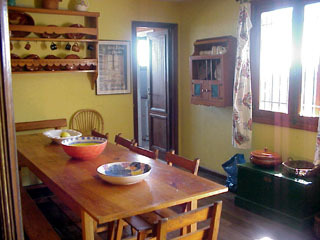 The bungalow is decorated with functional and basic furniture, and designed to enjoy outside life, with a porch, barbecue, stone tables, etc. Nearby you have everything, from restaurants to shop, golf course (in the island of La Toja, at 3 miles), summer sports clubs, nautical clubs (the most important is San Xenxo, just 8 miles away), etc, but as you are at the end of the residential area, if you walk further there are isolated marvellous beaches at 10 min. walking. In the ground floor there is the large living room, with plenty of views to the sea, dinning room, kitchen, four bedrooms ( three twins and one double), and two bathrooms. Upstairs there is a living area, one twin bedroom and one four-bed bedroom, plus a toilette. It is ideal for children, but not recommended for adults. 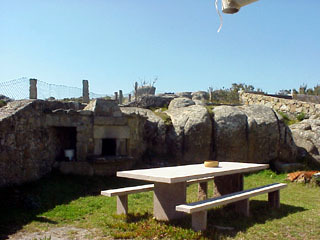 The large garden surrounds the house, and there is a barbecue and a stand-table to eat outside in the rear. 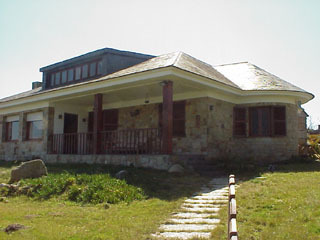 View of the house from the entrance gate. 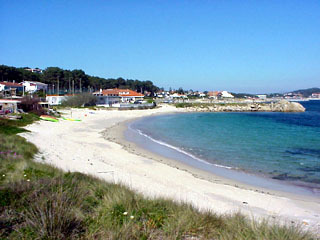 Beach of Punta Barrosa, in front of the house. 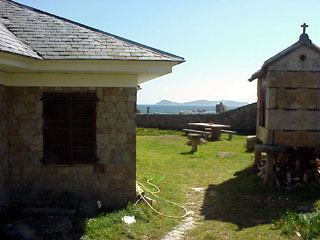 Back garden and views to islands. 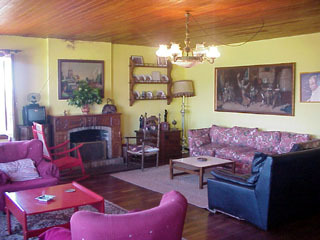 Prices are per week in euros for up to 10 people.